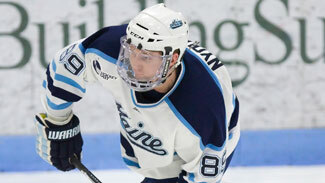 New Hampshire senior forward Bobby Butler, Wisconsin senior forward Blake Geoffrion and Maine sophomore forward Gustav Nyquist are the finalists for the 2010 Hobey Baker Memorial Award that honors college hockey's top player. The three finalists were selected from 10 candidates by the 24-member Selection Committee, and an additional round of online fan balloting. Criterion for the award includes strength of character on and off the ice, displaying outstanding skills in all phases of the game, sportsmanship and scholastic achievements. The other seven semifinalists were Denver's Marc Cheverie and Rhett Rakhshani, Northern Michigan's Mark Olver, RPI's Chase Polacek, Miami's Cody Reichard, Cornell's Ben Scrivens and Wisconsin's Brendan Smith. This year's Hobey Baker Award winner will be announced Friday, April 9 during the NCAA Frozen Four in Detroit (7 p.m. ET, ESPNU). Here is a closer look at the finalists. Bobby Butler -- The senior forward from New Hampshire is a native of Marlboro, Mass., and already has been named the Walter Brown recipient as the best American-born college player in New England. Butler evolved into a prolific goal scorer, leading the nation with 29 goals in 39 games this season. He chipped in with 24 assists to total 53 points, tied for second best in the country. The Wildcat captain tied for the Hockey East scoring lead with 41 points and led the league in goals, helping UNH to the regular season Hockey East title. Butler earned Player of the Year honors in Hockey East, and a berth as a First-Team league all-star. Butler has signed with the Ottawa Senators . Butler, a health management major, also volunteered for assignments involving the hockey program, attended a local middle school every week for the past three years working with special needs students, mentored two children (one who lost his father to cancer and another child battling leukemia), and volunteered with his teammates in the Reading Across America program at area schools. Butler is also a finalist for the Hockey Humanitarian Award. Blake Geoffrion -- The senior forward from Wisconsin is a native of Brentwood, Tenn., and is the grandson of Hall of Famer Bernie "Boom Boom" Geoffrion and the great-grandson of another Hall of Famer, Howie Morenz. His father, Danny, also played in the NHL. Geoffrion, a 2006 second-round pick of the Nashville Predators, was a Wisconsin captain and was named MVP of the West Regional last weekend. His 27 goals and 21 assists in 38 games rank second in the nation in goals and tied for first in the country with 14 power-play goals. Finishing second in the WCHA scoring race and topping the conference in goals and power play goals, he was selected as a First-Team all-star. Geoffrion, a consumer science major, also spends time off the ice visiting UW Children's Hospital, has mentored a cancer patient, and is a peer leader lending assistance to UW students. Gustav Nyquist -- The Maine sophomore is a native of Malmo, Sweden, and led the nation in scoring with 19 goals and 42 assists in 39 games. Maine ended the season tied for third-place in Hockey East, while Nyquist tied fellow Hobey Hat Trick finalist Bobby Butler for first in league scoring, and topped the Hockey East in assists. A 2008 fourth-round draft pick of the Detroit Red Wings, Nyquist was runner-up for Hockey East Player of the Year, and was selected as a First-Team all-star. Nyquist, a finance major and on the Dean's List, also volunteers off-ice time coaching at youth hockey clinics.